Lane Brooks '00 and Keith Fife G are showered with prizes after winning the 13th Annual 6.270 Autonomous Robot Design Competition with their robot, "Hermes," named after the Greek god of swiftness. Proving that speed and strength are sometimes impossible to beat, "Hermes" rammed its way to first place in this year's 6.270 Autonomous Robot Design Competition, held in room 26-100 last Wednesday. "Hermes" was built by Lane G. Brooks '00 and Keith G. Fife G, both students in Electrical Engineering and Computer Science. The objective of the contest, entitled "Raiders of the Lost Parts," was to design a robot which would collect balls, worth either positive or negative points. A robot could score either by dropping the positive balls into its designated bin or possessing the balls after the sixty-second round ended. Negative balls were equally important; although the ideal strategy was to drop the negative balls in an opponent's bin, the accidental accumulation of negative balls played a role in the outcome of many rounds. "Our idea was to keep it simple because it tends to work the best," Brooks said. "We just wanted a robot that was fast," Fife said. Speed was not the only part of "Hermes'" strategy, however. In an action that announcer Michael Allen G compared to aggravated assault, Hermes would attack its opponent after depositing its balls in the bin. "That pounding we did at the end was to try and beat robots that blocked us," Fife said. Using this strategy, "Hermes" caused so much damage to a robot named "JOB" in a final round that the remaining matches had to be rescheduled so that "JOB's" designers could make repairs to the robot. The Hermes team attempted to counter the strategies of robots they saw before the contest. "We were concerned about robots that would come meet us [at our end of the table]. 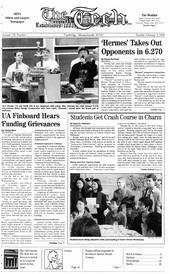 We were concerned about JOB," Brooks said. Hermes was undefeated through eight rounds of double elimination competition and a round-robin between the three finalists. 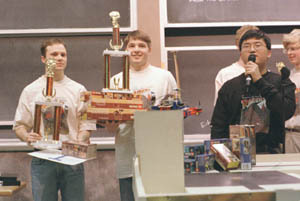 As a prize, the team won a boxed set of Indiana Jones movies, Lego sets, and two first place trophies. Hermes' speed is no surprise considering that Keith came up with a modification to the board that allowed them to receive 6 volts instead of the original 3 volts. Although this change was later adapted by all teams as an official alteration, no team used the additional power as well as Hermes. The second place robot, "Chaika," takes its name from the Russian word for seagull, according to team member Johann D. Burgert '01. "Chaika" is also the brand name of the cars used by the KGB. Nathan J. Ickes '01 co-designed Chaika. The robot with a large cheering section, "JOB," finished third. "JOB's" programmers, Jason H. Bau '00, Orton W. Huange '01, and Brian Chan '02, "stressed the rules" of the contest by implementing an expandable arm which pushed the negative balls across the table its opponent's bin. To qualify for competition, robots had to display the ability to score, said Andy Chang '00, a 6.270 organizer. Forty-nine of the 55 teams qualified for competition. The beginning of Wednesday's double elimination tournament was actually the third round of the contest; the first round took place last Monday morning and the second round took place Wednesday morning. Some teams came into Wednesday evening with a loss, and those teams which qualified but lost the first two rounds were already eliminated. The robots this year were controlled by new motherboards, supplied by Compaq. Whereas the last seven years' boards ran on 2 MHz and 32k, this year's robots ran on 200MHz and 32k boards. "I know the controllers weren't perfect. I want to thank you guys for helping me test them and being my unwilling guinea pigs," said Edwin W. Foo G, 6.270 lead organizer. Planning for this year's 6.270 contest began last February, shortly after last year's competition, according to Chang. The student organizers are responsible for running the contest; they secure sponsors, teach classes, and staff the lab. The existence of the contest depends on sponsors and donations. The Department of Electrical Engineering and Computer Science, Compaq Computer Company, Oracle Corporation, Hawker Energy Products, Inc., Microsoft Corporation, Polaroid, Inc., Lego Dacta, General Motors, and IBM Corporation were sponsors of this year's contest. As in past years, the contest was highly popular and 26-100 was filled to capacity by 5:20 pm for the 6:00 start. "It was a good experience. We had a lot of fun, we built a cool robot that was our goal and that's what we did," said Bernard F. Ahyow '01. The time pressure of the contest affected many contestants. "It seemed like time was flying by," said Jason H. Bau '00. "It's a lot of fun but three and one-half weeks is too short" a time period, said John W. Strohm '00.